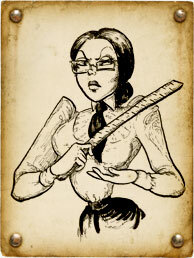 PATIENCE VIRTUE was for years the Headmistress of the Saint Swithin’s Home for Wayward Boys and Girls. Doctor Clockwork first witnessed her striking ability to discipline her Charges with a FIRM YET GENTLE HAND during a Picnic Outing in Oxfordshire, and at once he invited her to join his Expert Staff, thinking he might put her Skills to better use as a CUSTOMER SERVICE PROFESSIONAL. Though she hesitated to abandon her fledglings, Miss Virtue is above all a creature of COMMON SENSE, and, as such, easily found a solution by turning the youngsters into the care of her colleague, a Mister Fagin of South London. Admittedly, she initially had to be somewhat Diverted from her Tendency to mete out rewards and punishments alike by promising, or threatening, relatively larger or smaller portions of Gruel. Now, however, she has come into the full flower of her abundant natural Talent. Grown Ladies and Gentlemen may benefit from her Approach to any PROBLEMS OR COMPLICATIONS they might encounter in their Transactions, with a MINIMUM of FUSS AND NONSENSE!